It’s that time of year again when you begin to work outdoors. It’s also time to begin to think about UV protection for your hands from the sun’s rays. GO Greens™ provide excellent UV protection from UV-A and UV-B rays naturally without any chemical treatments. Certified independent tests demonstrate that they block 99.97% of both UV-A and UV-B rays and have a UPF 50+ rating. This UPF (UV Protection Factor) rating is used for textiles and should not be confused with the SPF rating used for FDA compliant sunscreen products. 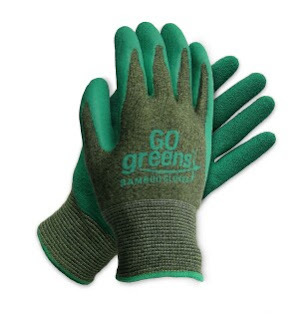 These earth friendly, form fitting coated gloves are made from sustainable bamboo, are biodegradable, anti-bacterial, very economic, and extremely durable. Click on the “title” of this post to see the GO Greens Gloves in action and for more information. GO Greens are also great (and profitable) for fundraising events.